The Salsa quarter-round function. Four parallel copies make a round. 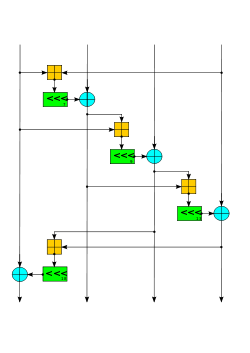 2008 cryptanalysis breaks 8 out of 20 rounds to recover the 256-bit secret key in 2251 operations, using 231 keystream pairs. The ChaCha quarter-round function. Four parallel copies make a round. ^ Daniel J. Bernstein. The Salsa20 family of stream ciphers (PDF). 2007-12-24. ^ Daniel J. Bernstein. Salsa 20 speed; Salsa20 software. 2013-05-16. ^ Yukiyasu Tsunoo, Teruo Saito, Hiroyasu Kubo, Tomoyasu Suzaki and Hiroki Nakashima. Differential Cryptanalysis of Salsa20/8 (PDF). 2007-01-02. ^ Zhenqing Shi, Bin Zhang, Dengguo Feng, Wenling Wu (2012): „Improved Key Recovery Attacks on Reduced-Round Salsa20 and ChaCha“. ^ Nicky Mouha, Bart Preneel. 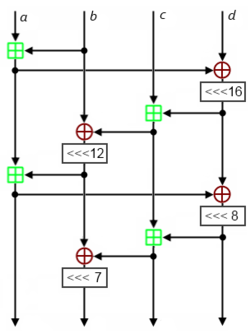 A Proof that the ARX Cipher Salsa20 is Secure against Diﬀerential Cryptanalysis (PDF). 2013. ^ Miller, Damien. ssh/PROTOCOL.chacha20poly1305. BSD Cross Reference, OpenBSD src/usr.bin/. 2013-12-02 [2014-12-26]. ^ Murenin, Constantine A. Unknown Lamer, 编. OpenSSH Has a New Cipher — Chacha20-poly1305 — from D.J. Bernstein. Slashdot. 2013-12-11 [2014-12-26]. ^ Murenin, Constantine A. Soulskill, 编. OpenSSH No Longer Has To Depend On OpenSSL. Slashdot. 2014-04-30 [2014-12-26]. ^ deraadt (编). libc/crypt/arc4random.c. BSD Cross Reference, OpenBSD src/lib/. 2014-07-21 [2015-01-13]. ChaCha based random number generator for OpenBSD. ^ riastradh (编). libc/gen/arc4random.c. BSD Cross Reference, NetBSD src/lib/. 2014-11-16 [2015-01-13]. Legacy arc4random(3) API from OpenBSD reimplemented using the ChaCha20 PRF, with per-thread state. ^ ChaCha Usage & Deployment. ^ arc4random - NetBSD Manual Pages. [6 January 2015].